Located in the north of Paris, a few steps away from the Sacre Coeur Basilica and Moulin Rouge, Les Puces is known as one of the largest Flea Market in the world. For a fun-filled weekend, it’s one of the best places to go for shopping in Paris: antique jewellery, furniture, old books, records and vintage clothes, Les Puces de Saint Ouen, a perfect place to pick up a present for the hard to please and fashionista hipsters with the help of antique trade dealers. After the WWI, the market became so popular that some "business men" decided to buy land, pave the roads and bring in water and electricity so as to rent out stalls at a cheap price. Between 1920 and 1991, indoor marketplaces were set up. At the end of the 1990's, an urban development plan was put into effect in the area. In 2001, the entire marketplace was classified as "Zone de Protection du Patrimoine Architectural Urbain et Paysager " (urban architectural landscape heritage protection zone) for its very unusual atmosphere. A very wide range of objects and styles, from every era and country satisfy both the bargain hunter and the couple strolling through hand-in-hand. There are more than 2,000 boutiques spread out into 16 markets and spilling over into several surrounding streets so every type of tourist is welcomed: solo, couples, families. 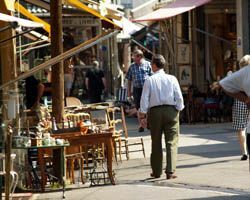 Here is a huge scope in terms of wares and prices in each markets selling antiques, a stall-by-stall guide: Vallès market, Biron Market, Vernaison Market, Malik Market, Dauphine Market are some famous names in the world’s largest Les Puces de Saint Ouen markets. The prestigious Paul Bert and Serpette Markets owned by the British property corporation Grosvenor group from 2005 to 2014, (the Grosvenor estate represents all the business activities of the Grosvenor family, headed by Gerard Cavendish Grosvenor, the Duke of Westminster) was sold to a French investor, a property investment considered as a small part of French heritage. 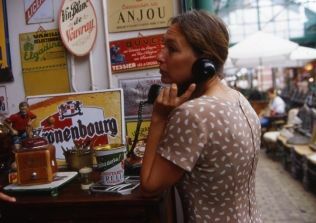 All the artsy quarters, sprawling antiques bazaar, major vintage shops and antiquarians of the well-established Flea Market “Marché aux Puces” in Paris Saint Ouen can be visited freely every Saturday, Sunday and Monday. This vibrant Parisian flea market is served by metro Porte de Clignancourt-line 4, accessible with a regular subway ticket (zone 1) and several bus lines link visitors from the center of the capital easily to the market too. On the outskirts of famous Paris Marché aux Puces St Ouen Market, proliferate smaller markets, street peddlers, hawkers, a few thrill huskers… selling a dizzyingly eclectic array of bric-a-brac and knickknack. The bustle and hustle for the best hunting grounds for fashion gimmickry of clothes and jewelries. Street peddles activities operate massively around the market. Nevertheless it is a safe haven to meet all your shopping needs. Getting at Porte de Clignancourt early, stop at those famous open-air-terrace café for a pause for French pastries to enjoy the charm of daily life in Paris before the fun of poking around along the covered markets. See other walks that could please you in Paris. If you're only there for a few days, don't miss our article about the essential things to do in Paris. If you want to always know more about the Flea Market, don't miss the free newspaper devoted to it. Open on Fridays, Saturdays, Sundays and Mondays: from 9:45 a.m. to 1 p.m. and from 2 p.m. to 5:45 p.m.
Open on public holidays (except on January 1st, May 1st and December 25th).